AUSTIN -- State psychiatrists are making crazy money. 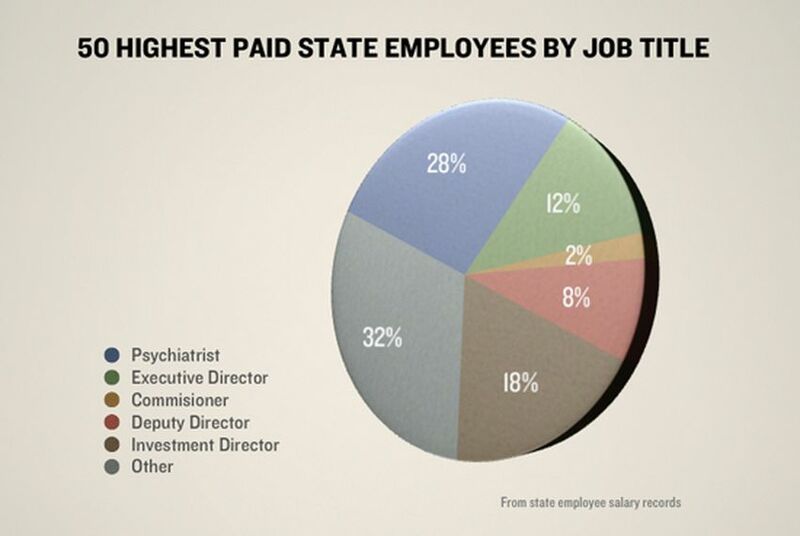 Of the 100 highest paid state employees, 45 are psychiatrists, most of them employed by the state’s 10 mental hospitals. Six state psychiatrists make base salaries of at least $200,000 – more than the commissioner of the agency that hired them. And many make tens of thousands of dollars a year in compensatory pay, in some cases more than doubling their base salaries. The average base salary for a state psychiatrist is $150,000. The average psychiatrist makes an additional $20,000 a year for working extra hours, but some bring in more than $100,000 in annual overtime. Officials with the Department of State Health Services (DSHS) say they have no choice but to pay top dollar for psychiatrists, who can easily make $200,000 a year in the private sector. Texas agencies already face a shortage of mental health workers; more than 20 percent of state psychiatrist jobs are vacant. If they don’t offer competitive salaries, they say, they won’t stand a chance luring doctors to mental hospitals in Big Spring, Vernon, and other far reaches of the state – 200- and 300-bed facilities that sometimes house criminal offenders. But fiscal watchdogs say these salaries are out of control. The top-paid psychiatrists make more than the commissioner of the Department of State Health Services and the executive director of the Texas Department of Criminal Justice, both of whom oversee multi-billion dollar budgets and make about $185,000 a year. And the additional pay psychiatrists get for working extra hours is staggering. San Antonio State Hospital psychiatrist Steven Cathey made $325,000 in 2008, more than half of it from compensatory pay. Gail Johnson, a psychiatrist at the North Texas State Hospital’s Wichita Falls campus, made nearly $300,000 -- $100,000 of it from working extra hours. All told, psychiatrists cost the state more than $20 million in 2008. Cathey, a staff psychiatrist who works more than 100 hours a week, said he pulls an overnight shift every other night just to fill vacancies at the San Antonio State Hospital. If he didn’t, he said, the hospital would have a crisis on its hands. But agency officials say they’re doing everything they can to attract more psychiatrists, and simply can’t find enough people to fill the jobs.